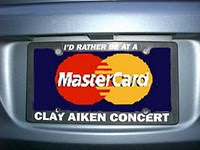 I’m back off the road again after a four day journey to see Clay Aiken’s special concert that was filmed for PBS. I will spare you the crazy adventures of three New Englanders and one New Yawker through parts of Virginia on the way down to Raleigh. I didn’t quite know what to expect with this concert. This era of music is not mine and was only partially my parents. We knew 3-4 of the songs by name and they really didn’t excite me. As I walked into the Memorial Auditorium, I just wanted it to be good. This was a very important concert for him. I shouldn’t have worried. From the minute the curtain rose and a debonair Mr. Aiken stood there with his back to us in a pose that can only be described as C to the OOL, my head was spinning. I think I described it later as OMG overdrive. I’m not sure I took the requisite number of breaths per minute for a person sitting down. He opened with Mack the Knife. I’m too young to remember Bobby Darin and to me this song was always something a cruise singer would do in some schmaltzy rendition in the all night lounge. How wrong I was. You couldn’t help but move your shoulders in a sort of sitting strut. The last note was so long that I think the seasons changed from spring to summer. The band was a mix of traditional and jazz orchestra. There were about 15 musicians on stage but the wall of sound that filled that Auditorium sounded like twice that number. They were really getting into it as well, which added a level of enjoyment to the show. Song after song from the 50s and 60s but with a twist. 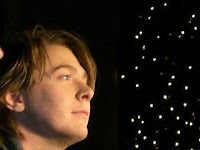 It was like being transported in the Way Back Machine but we’d landed in an alternate universe where they still sounded true to their era but with a side dose of 40’s big band/swing and a heaping teaspoon of the unique voice of Clay Aiken. Songs I was sure I would hate sounded like nothing I expected and that I must hear again. June 1st is just too far away. I feel like an addict on involuntary withdrawal. And he was in his element. The man belongs on a concert stage but this was something we’d not seen in his six years with RCA. First class production. Support from the highest level of the new record label. A lighting show that was like another instrument on stage. We didn’t get to see Vince Gill or David Sanborn, who are the musical guests on this album. But when Clay explained that he wanted to do a duet with the best female voice and he introduced Linda Eder, it made the circle of support complete. They sang a duet of Crying that made it my second favorite song of the night. He hit notes that sounded like they were just invented. Her voice was as smooth as maple syrup on a cinnamon pancake. The show had his usual moments of humor and a wonderfully nostalgic appearance by longtime friend, Ruben Studdard. I won’t spoil the special medley they sang, get yourself to one of their shows this summer. There was a special tribute to his teachers, many of whom were in attendance. He thanked them for their work and for their impact on his life and softly began a version of the Beatles’ In My Life, accompanied by a guitar and a single cello. His voice was a bow across my heartstrings. Many people were deeply affected. Probably because the line “there is no one compares to you” meant him and meant us -because that night we were one. But there was one song that I can’t get out of my head. One song that I figured was a good idea for the album, even though I would probably skip the track since I’ve heard him sing it dozens of times in concert. When he introduced the song and said he had sung it his whole life and was so thrilled to have his own version, I thought he meant his own professionally recorded one. He started the familiar refrain of "Oh, my love…my darling, I’ve hungered for your touch.." But something was different. It was enough of the core melody to know the song but he was hitting different notes, minor key notes, lilting notes. When he got to the build up for the money note-that falsetto that defines whether the song owns the singer or the singer owns the song-well, I can’t put into words what happened. The voice, the band, the lighting all combined to create what I’ve heard described as an earthquake, an airplane taking off, a lightning bolt and a gunshot. We literally felt pushed back against our seats. He more than owned the song. He stole the song away from anyone who might ever try to sing it again. All of you singers with Unchained Melody in your set list? Don’t even bother anymore. Tried and True was a great title when I first heard about it. It seemed to describe these songs. Good, familiar, safe. Now, I don’t think it fits. What he did with these songs was anything but familiar and safe. And it was so far beyond good, I’m going to write to Merriam Webster to ask them to create a new adjective. Thursday morning after the tenth review of my packing list, I’ll load my suitcase in the car and head south. I might leave the music off for awhile and just absorb the sound of the road with the sound of my thoughts. It will take me about an hour and forty-five minutes to get to Nan’s house, depending on the ever present construction on Route 7. I met her in 2003 and they were working on Route 7 back then. 2003. Hard to believe it’s been that long since we met up at a restaurant to plan a Clay Aiken fan get together. We’ve been to many places together either meeting up at some airport or driving to all parts of the northeast running on little sleep, caffeine, adrenaline and excitement. This time, we’ll wait for another good friend to arrive and start the trek south. South to Raleigh...affectionately called Mecca by many in the fandom. We weren’t going to make this trip. During these hard economic times of employment uncertainty, rising costs of healthcare and college tuition- sacrifices have to be made. I had resigned myself to the fact that I would get to watch this concert on PBS in June. I like to try to get to the “one-of-a-kind” events, like the snowflake lighting in New York City or the Sedaka tribute event. They each have special memories that can’t be duplicated in the way one show from a 30 city tour can, despite the fact that Clay’s extraordinary quick wit makes each concert unique. And a televised concert was on my wish list blog to Decca Records a couple of months ago. Sigh, this was going to be harder than I thought. Then something happened. A spark was lit and it made the thought of missing this concert/taping unthinkable. The spark was started by Clay himself with his arranging a special pre-sale for the fans and answering every question imaginable about the taping. It was so good to see him so excited. This was a big deal. How could we miss it? When Nan suggested that we drive the 10+ hours but break it up over a couple of days, I quickly decided that it was time to a cash in those American Express points that had built up over years of paying for concerts, hotels and flights. One concert was going to pay for another. The struggle that Clay had in keeping his recording career moving despite a lack of support from his label would be rewarded with all the support he deserves from this new label. And we need to be there to celebrate that as he unveils his new album for television. The message boards are in a pre-travel state. It’s the day before most begin their trips. It’s the “one more sleep” day. It’s funny but the chatter on the boards almost feels like real audio. Like you can hear everybody saying the words that they are only typing on a keyboard. It’s bursting through my monitor in sound bites (soundbytes? ), the way the voices came through the television in Poltergeist. It’s a special man and a special voice that can create this bond amongst so many strangers. Some of us have been friends for seven years now. Some of us will meet for the first time. People are coming from nearly forty states and three countries on planes, trains, busses and automobiles. But all roads lead to Clay this week. Because Tried and True is more than an album title. It’s a bond between singer and fan.